Climb Stairs Safely and Easily! With Scalamobil IQ, you can make any destination accessible. It attaches to your own manual wheelchair with a seat width of 11" or larger. A discreet bracket is installed on the wheelchair frame to facilitate the attachment of the scalamobil. 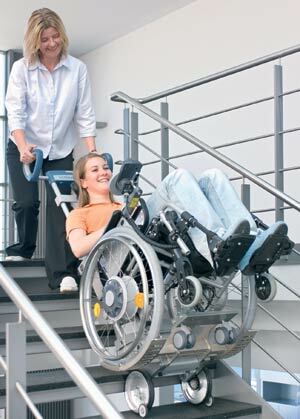 To climb stairs, simply attach the scalamobil to the wheelchair bracket with the quick-release locks, remove the rear wheelchair wheels and you are ready to maneuver stairs. From narrow, steep or spiral staircases to wood, stone or carpeted steps - scalamobil IQ overcomes it all! Whether used indoors or out, no modifications or installations to building structures are required. Available in the 5-state area surrounding Minnesota. Push the One-Button Control on the Alert Sentry portable pendant or on the Main Console Unit. One of our Call Center Operations will speak to you through the Alert Sentry System. The Operator confirms your immediate needs and takes action. 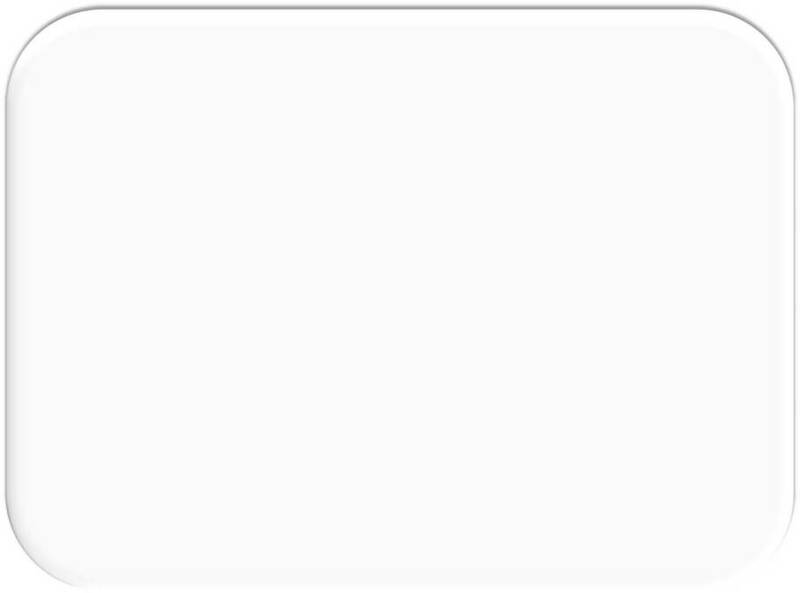 The Call Center Operator immediately relays the emergency response based on the customer's direction or on a pre-arranged plan. Make any Chair a Lift Chair! Cushion or Uplift Seat Assist. 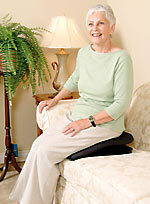 They provide safe, controlled support and lift up to 80% of a user’s weight. helpful in the kitchen, dining and living rooms. • People who have lost sufficient upper or lower body strength to get up unassisted. • Caregivers who need help transferring patients or family members. transferring in and out of bed. Unlike fixed-style bed rails, our Smart-Rail™ can unlock and pivot outwards to provide better standing support with less reaching and twisting. An award winning modular support system designed for those requiring assistance with standing, transferring, or moving in bed. 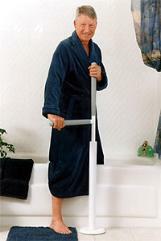 Base Dimensions Depth: 16"; Width: 15"
Seat Dimensions Depth: 19"; Width: 17"
Seat Height Open: 10"; Flat: 2"
If you are a homeowner or are responsible for a group home or institution, then the quick, easy, install-it-and-forget-it advantages of the Easy Toilet Riser™ means that our high level toilet layout solutions can give you peace of mind. It’s time to stop using those rickety toilet-top contraptions. They’re dangerous and they leave you open to lawsuits. Toilet-top Toilet Risers™ can cause damage to the seat during the constant mounting and removal necessary. The unnatural stress of over-the-top usage can damage a toilet’s foundation. Storing toilet top high level Toilet Risers™ between uses can lead to the spread of harmful bacteria. The Medway Easy Toilet Riser™ eliminates all these risks. Our high level Toilet Risers™ guarantee that toilet safety is unimpaired. Constant mounting and removal are unnecessary; just install them once and you can forget about it. The Medway Corporation Easy Toilet Riser™ goes in at the toilet base, so upper toilet damage is avoided, and there is no extra topside stress that bears on the toilet. There is nothing to store so there’s no risk of contamination. 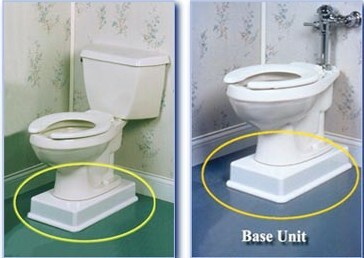 The Easy Toilet Riser™ is bolted permanently to the floor to create a solid and sturdy sitting surface for the user. 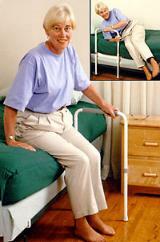 A floor mounted support rail which promotes safe and independent standing and transfers. The key to the effectiveness of the Advantage Rail™ is in the unique operation of the horizontal rail. 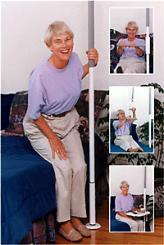 providing moving support similar to a walker, yet it can lock in an instant in case of a loss of balance, need for rest, or to assist to a seated position.